Host plants for this species are species in the family Acanthaceae. Mature larvae with black body and numerous branched black spines; head with 2 very short spines. Adults brown with dark brown lines and orange eyespots, near upper margin a white spot, hind wing with 6 orange eyespots. 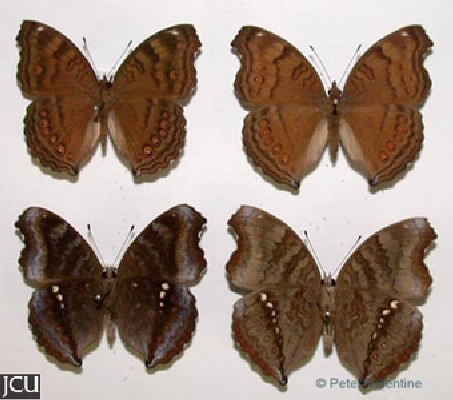 Lower surface similar to upper but darker brown with lilac or purplish tinge, eyespots reddish-orange. Small projection on hind wing.